I've resisted it for ages and ages. Arguing that we didn't need it as we had it at EK and the was still never anything on. And that with all the new free-to-air channels, there was already way more to choose from than before. But the truth is, there is mostly just crap on those new channels, and even though Foxtel do play a lot of the same crap, they also play a lot of the good stuff. The decision was made yesterday, after we'd spent over $100 in Jb Hi-Fi buying TV shows on DVD. Something we do on a regular basis. We had a look at the packages on Foxtel and it's cheaper to pay for that each month than it is to continuously buy DVD's! So that's what we are doing. Dave is very excited about the sport, not that he can take advantage of it till next year when footy season starts. Every footy game will be able to be watched. Joy. I've already sat down and gone through and written all of the shows down that we'll want to tape (we're getting IQ) and I'm sure we'll discover many more! 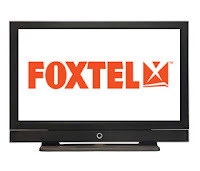 Do you have Foxtel? Do you think it's worth it? Are there any shows I should check out once it's installed? We got foxtel because I got irate about not seeing the Football (AFL) in my case. DH has embraced it as it allows him to watch the international cricket. Among others. We also love the movie channels and everything on Sci-Fi. Sanctuary and Stargate Universe are the most up to date offerings. That's the thing I'm looking forward to with the football, actually getting to see our teams games. I don't really need to see the others though, but I'm sure it will give me plenty of time to read! Lol! Dave is also excited about getting to watch the cricket. He does shift work and so is home at odd hours of the day and he often complains about having nothing to watch while on the treadmill! I'm really annoyed that we are getting installed a week after Sanctuary re-starts! We have been watching it on DVD (we are massive stargate fans!) and I'm keen to see what happens. Hopefully they'll replay the first few eps a few times! Thanks for the other suggestions, I will admit I'm getting a little excited now! oh kylie! you wont know yourself. we have austar mystar (same as fox iq). i physically need to turn the tv off at 9am and put my ipod in, otherwise i don't get any house work done! i love the delicious miss dahl (sophie dahl's cooking show), cake boss, nigella, keeping up with the kardashians (if reality is your sort of thing) and jersey shore is a complete train wreck (ie. it is so so bad, but i can't bear to look away).